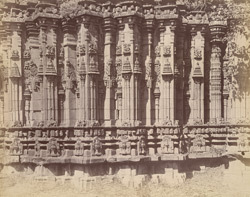 Photograph of the sculptures on the shikara of the Dodda Basappa Temple at Dambal taken by Henry Cousens in the1880s. The Dodda Basappa (Great Nandi) Temple was built in the 12th Century in the Late Chalukya style. It is built on a stellate plan with many angle projections. The walls are decorated with pilasters, both in couples and in pairs and miniature temple towers in relief. The sanctuary is covered by a multi-storey roof with the same projections of the sanctuary walls. The temple has a linga sanctuary and is dedicated to Shiva.